So we started our adventure with my first subway ride. We arrived 10 minutes early, which if you know me is exactly how I'd want it to be. 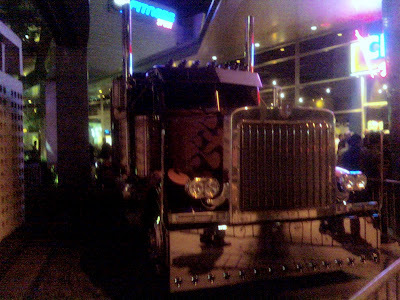 The ride itself was inconsequential which, again, is exactly like I felt it should be. The only problem I had was that my foot slipped out of my shoe because my new socks are still to slippery. It sounds ridiculous but that's my reason. On the way out we saw Michael Jackson's star on the walk of fame. 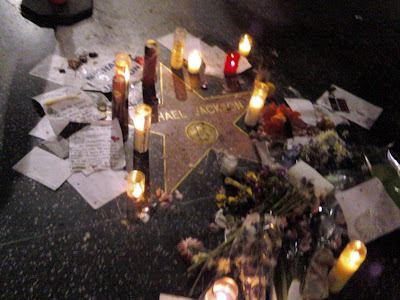 As you can see from the picture many people have already paid tribute to the king of pop. After our walk from the subway we arrived, with only minutes to spare, at The Arclight. 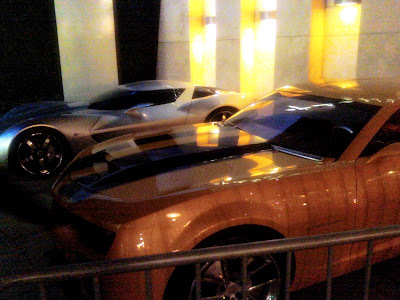 The place is huge and as you can see from the pictures had the actual movie cars in front. You have to pay fifteen bucks to reserve seats and most shows are sold out. We went to a LATE show so we could get decent seats. The movie was exactly what you've heard it was. It was mindless escapism at it's most bombastic. At two-and-a-half hours long the movie pushes it's luck on a few occasions. I think I could have edited out another half an hour and fixed my biggest issues but on the whole I had very few complains. I would have taken better pictures but there was a crowd outside of a club next door and we were in a hurry to make it to the subway. There were some cameramen so somebody in the crowd must have been famous. O'Neil claims he saw T-Pain. It's two in the morning at this point and we didn't know it but the subway had already closed. We then hopped on a bus. We realized it was heading the wrong direction and got off immediately. Then we got in a cab which took us home. So I used all major forms of public transportation available tonight. What an adventure!